Today on #ThatBusinessShow, we once again highlighted the successes of female entrepreneurs through our weekly #WorkingWomenWednesdays feature. This weekly feature is each Wednesday at 8am on 1250WHNZ and interested professionals can learn more about this group and ways to get involved at http://www.workingwomenoftampabay.com. 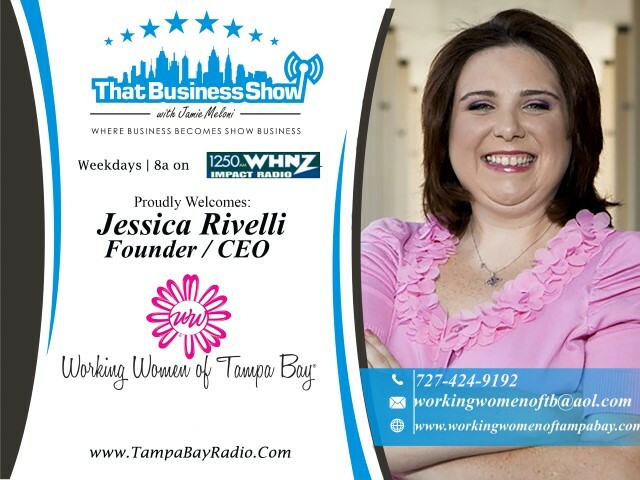 CEO and Founder Jessica Rivelli checked in at the top of the hour with an update on the Working Women Conference being held September 10th and 11th at the Straz Center in Tampa. Early bird pricing has been extended through this week and use the code Meloni2015 for a discount on the tickets! Visit http://www.workingwomenconference.com for more information and to pick up your tickets. Also we are holding a networking event at the iHeart Media building at 4002 W Gandy Blvd Tampa on July 22nd at 5pm and those that would like to attend should email Jamie at Jamie@tampabayradio.com to confirm their attendance. This will be a great mixer and a chance to meet many of the guests that have been on the show and to inquire about coming on the show for yourself! My 2nd guest for the show was Mary Beth Kerly or Beth for short. 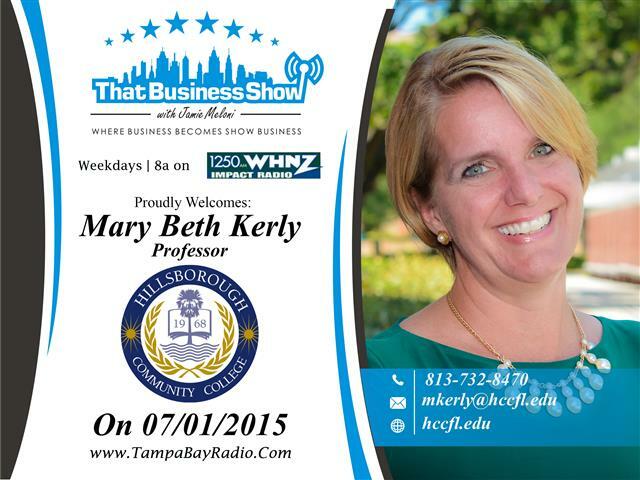 Beth is a Professor at Hillsborough Community College and spoke of the HCC Entrepreneurship and Innovation Program that she co-Founded. This 12 credit course is open to all students and people outside the College and is a semester long course designed to get the entrepreneur up and running with their product or service. The cost for the program is $1300 and is a wise investment if you have a product or service ready to launch. The feedback and information from the course could very well save you much headache and cost on a failed idea or misguided idea and through this course, you can get the feedback from both Beth and fellow classmates on the viability of your project. Enrollment for the fall class is open and contact Beth for more information at 813-732-8470 or email at mkerly@hccfl.edu and visit http://www.hccfl.edu for more information! My third guest on today’s program was Jen Prater. Jen opened the 2nd segment with commentary on her involvement in the HCC program as she is a guest lecturer providing information and lessons on the insurance business. Jen is a business insurance agent with Merchant Insurance Solutions and speaks of the importance to mitigate risk and potential loss through proper insurance products. Jen is also highly involved in the South Tampa community and speaks of her involvement in several organizations including the Hyde Park Neighborhood Association and finalizes the discussion on her involvement on a new dog park that will be located along Swann Ave that has her and City leaders working together on at this time. 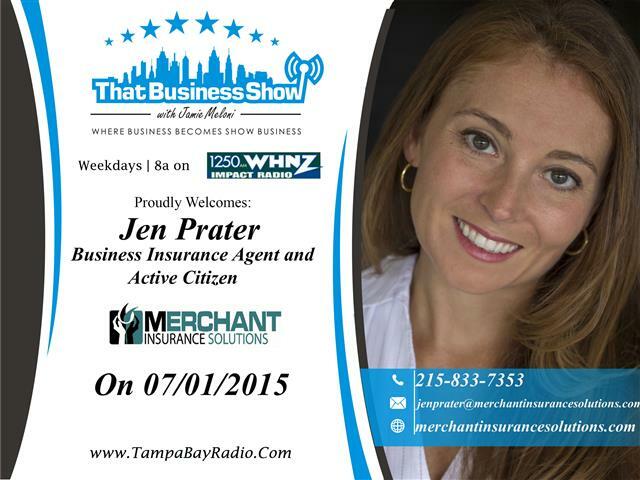 Jen is ready to assist you with your business insurance needs and you can contact Jen directly at 215-833-7353 or email at jenprater@merchantinsurancesolutions.com and learn more at http://www.merchantinsurancesolutions.com! This entry was posted in Entrepreneurship and Business and tagged bank owned, business, entrepreneur, foreclosures, real estate, tampa bay reo, tampa real estate. Bookmark the permalink.